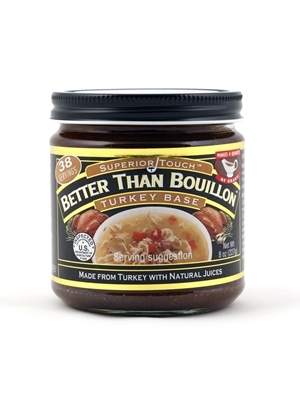 Better Than Bouillon turkey base is made from real turkey and juices giving it a richer, more robust flavor than ordinary bouillons. No MSG, no fat and lower sodium -1/3 less salt than ordinary bouillons. Each jar contains 38 one cup servings or enough for 9 1/2 quarts of broth or enough for 4 quarts gravey. Dissolve 1 teaspoon turkey base in 8 oz boiling water. For each quart of stock needed, use 1 1/2 tablespoons turkey base. Turkey meat with natural juices, salt, maltodextrin (from corn), chicken fat, autolyzed yeast extract, sugar, flavoring (onion powder, spices and spice extractives), dried whey, modified food starch, caramel color. We love the Better than Bouillon products but my husband has developed sensitivity to chicken. We bought this thinking it was chicken free but contains chicken fat! :( Would love a truly chicken free turkey bouillon from this company. The best tasting bouillons ever! This adds so much flavor to stuffing, soups and gravy. I make sure I have a jar in my fridge year round. I am trying out their turkey gravy this year and I know I will enjoy it too.